Preheat the oven to 325º. Line 2 baking sheets with parchment paper (make sure the pans will fit together in the oven). In a medium bowl whisk together the flour, 1 1/2 teaspoons cinnamon, baking powder, and salt. In the bowl of a stand mixer fitted with the paddle attachment or with an electric mixer, cream the butter and sugars until fluffy. Scrape down the sides of the bowl and add the egg, beating well. Add the 2nd egg and beat again. Scrape down the sides. Mix in the vanilla and then the dry ingredients. Transfer the dough to a lightly floured work surface. Divide the dough in half and shape each half into a 9-inch long, 1 1/2-inch wide log. Transfer the logs to the baking sheets. In a small bowl beat remaining egg and brush the logs with the egg. Bake until golden brown (dough will spread), about 35-40 minutes. The dough will be slightly soft to the touch. Allow the dough to cool on the baking sheets for 20 minutes. Maintain the oven temperature. In a small bowl mix the 2 tablespoons of sugar and the 3/4 teaspoon cinnamon. Carefully transfer the logs to a cutting board. Using a sharp or serrated knife, cut a sliver off each end (those can be nibbled on). Cut the logs into 3/4 -inch wide diagonal slices. Place the biscotti cut side down on the baking sheets. 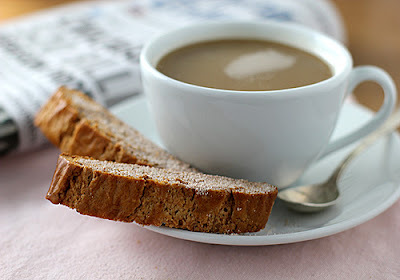 Sprinkle 1/4 teaspoon cinnamon sugar mixture over each biscotti. Return to the oven and bake for another 20 minutes. Biscotti will still be barely soft in the center, but they will harden as they cool. Cool on the baking sheets. Can be made 1 week in advance. Store in an airtight container. Enjoy! These look fantastic. I'm making them tonight. 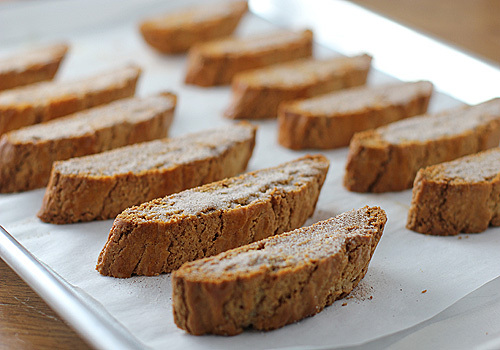 I bet these biscotti taste and smell just like cinnamon & sugar toast! 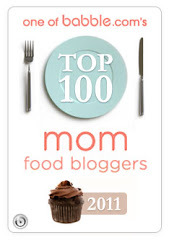 They are making their way onto my bookmarked recipe list :). OMG...I forgot to mention the smell factor. It is incredible!! These are delicious. I do hope you try them! These biscottis look so comforting nested up to your coffee! You triggered a serious biscotti craving. Nicole -- Love the blog! I am going to filch some of these recipies for my own enjoyment. Thanks for sharing your culinary talent with the rest of us! I'm starting to amp up my biscotti recipes for Christmas and these look wonderful! The cinnamon sugar mixture shouldn't dissolve or melt, but with the heat from the oven should make it adhere. I haven't had any troubles with it not sticking. You could try lightly spritzing the cut sides with water and then sprinkling the sugar. But, in all honestly the flavor won't be lost if a bit of the cinnamon sugar doesn't stick. They will still taste yummy. I just found your recipe on Pinterest! They are in the oven baking, but I had a little trouble. When I turned the dough out it was very hard to work with. I used flour and it helped but it really was all I could do to get them on the pans! Is this the way it should be? I just want to make sure I am doing it right! Thanks for the recipe!! It is a softer dough than a rolled cookie dough and the dough once baking will spread out a bit. The end result should be fine and tasty. If it spreads more than your liking, next time just place the dough in the freezer for about 15 minutes before baking.